How do you optimize a solid and strategic partnership? How can you align the governance roles and responsibilities of your CEO and volunteer leader? ASAE: The Center for Association Leadership has designed the CEO Symposium to provide leadership discovery and direction in an ever-changing association workspace. 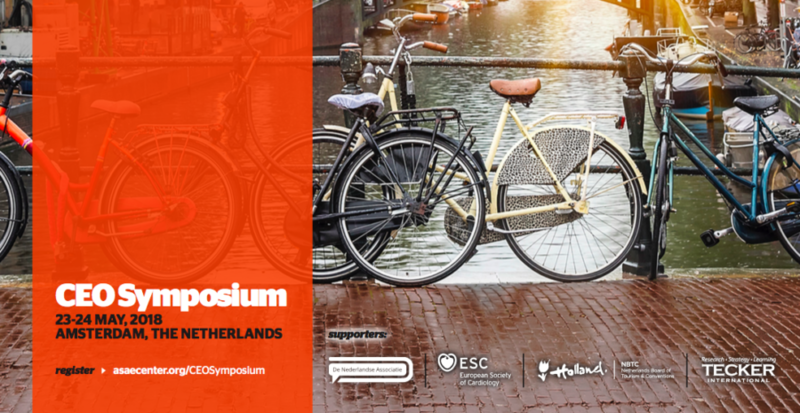 Taking place in Amsterdam 23-24th May, the Symposium encourages association executives to evaluate annual priorities and offers insight on how best to work with their incoming leader. Glenn H. Tecker is chairman and co-CEO of Tecker International. He has more than 35 years of experience assisting associations and corporations in planning for change. Glenn is widely acknowledged as one of the world’s foremost experts on leadership and strategy. He has worked in an executive capacity with businesses, public agencies, and nonprofit organizations and served as a board member for many nonprofit and for-profit organizations. Glenn’s expertise in the areas of governance, program strategy, organizational design, research analysis, and presentation skills will be critical to the effort. Register at ASAEcenter.org/Amsterdam to facilitate strategic conversations around your association’s strategy, digital transformation, research and analytics, engagement, and resource allocation.